Figure 1. structureViz2 in action. In this screenshot, the PFAM family PTE (phosphotriesterase) has been loaded in Cytoscape. Three of the available structures have been opened in UCSF Chimera and spatially aligned. Parts of one structure (pdb: 1EZ2) are selected, as indicated with green outlines in the Chimera window and blue font in the Molecular Structure Navigator. Click on the image to enlarge it. 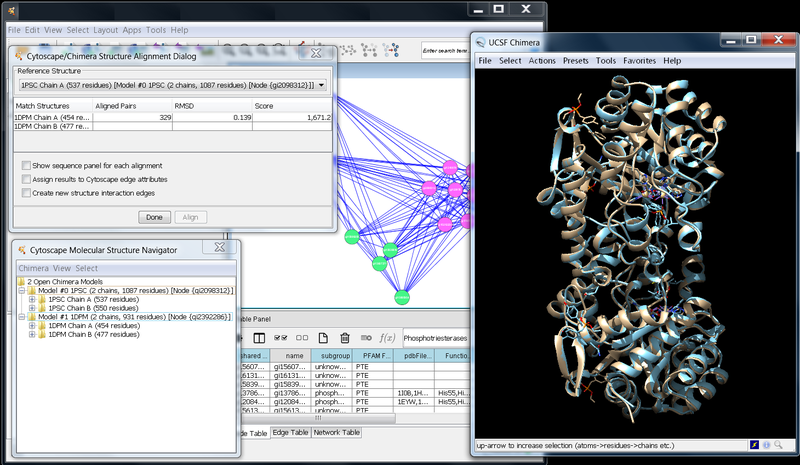 UCSF structureViz2 is a Cytoscape app that links visualization of biological networks in Cytoscape with visualization and analysis of molecular structures in UCSF Chimera. It is part of a broader effort to develop and apply tools for the visualization and analysis of biological context. Networks consist of nodes and edges. For structureViz2, molecular structures are associated with nodes using the node attributes. Macromolecular structures are specified by Protein Data Bank identifiers (PDB IDs) and small molecule structures by SMILES strings. Homology-modeled protein structures can also be associated, as detailed below. In addition, protein structures can be represented as residue interaction networks (RINs), where nodes correspond to amino acid residues and edges to their covalent or non-covalent interactions. Individual residues can then be associated with RIN nodes as described below. As an alternative to interacting with Chimera directly, structureViz2 provides a simplified, tree-based interface to structures called the Cytoscape Molecular Structure Navigator. This interface allows selecting models, chains, and residues and adjusting their display. Basic interfaces are also provided for spatially aligning macromolecular structures and for analyzing steric clashes and hydrogen bonds. If you haven't already done so, download and install the latest version of UCSF Chimera. Install structureViz2 from the Cytoscape App Manager (see the App Manager option in the Apps menu; structureViz2 is listed under the molecular structure tag). Now structureViz2 actions should be available in the Cytoscape Apps menu and node context menus. We recommend installing the RINalyzer app for working with residue interaction networks (it is also listed under the molecular structure tag). Annotating a network with structures entails creating new node attributes and populating those attributes with structure identifiers. Once a structure is opened in UCSF Chimera, structureViz2 automatically associates it with all nodes that are annotated with that structure. The type of each attribute can be String (if multiple identifiers, a comma-separated list) or List (with each identifier given as a single string). Macromolecular structure (PDB) identifiers. One or more PDB ID codes can be associated with a node as an attribute named Structure, structure, pdb, pdbFileName, PDB ID, or biopax.xref.PDB. Small molecule (SMILES) identifiers. One or more SMILES strings can be associated with a node as an attribute named Smiles, smiles, or SMILES. This mainly provides a convenient way to load small molecule structures into Chimera. For more traditional cheminformatics applications, see the chemViz2 Cytoscape app. Residue identifiers. An attribute named FunctionalResidues or ResidueList can be used to specify residues of interest. In general, a residue specification is of the form pdbID#residueID.chainID. The pdbID is the 4-character PDB ID of the structure. A chainID is a character used in the structure file to group residues by chain. A residueID may be a single-letter code and residue number such as H263, a three-letter code and number such as His263, or simply a residue number, such as 263. Like the other types of identifiers, residue specifications can be given individually or as a comma-separated list: His236,Lys238, Met240. A range of residues can also be specified: 236-250. To handle cases in which a node is associated with multiple structures and the residues of interest differ between those structures, PDB identifiers can be included: 2uz9#His82,2uz9#Thr102. If no PDB identifier is given, the residue specification is assumed to apply to all of the structures annotated to the node. General identifiers. A whole protein structure or a subset of it, such as one or more chains or residues, can also be associated with a node as an attribute named Structure, structure, pdb, pdbFileName, PDB ID, or biopax.xref.PDB. The specification is of the form structureID[.modelNO]#[residueID][.chainID]. The structureID is either the 4-character PDB ID of the structure, or a path to a local file enclosed by quotation marks, or an URL enclosed by quotation marks. A modelNO is the model number and needs to be specified for PDB structures or files containing several different models, such as NMR structures. A chainID is a character used in the structure file to group residues by chain and should be included in the identifier for structures with more than one chain. A residueID may be a single-letter code and residue number such as H263, a three-letter code and number such as His263, or simply a residue number, such as 263. Like the other types of identifiers, the specifications can be given individually or as a comma-separated list. If no PDB identifier is given, the specification is assumed to apply to all of the structures currently open. Such annotations are usually created automatically for RINs, but can also be added manually. In addition, homology-modeled structures can be fetched from ModBase if the node ID is a ModBase-searchable type of sequence identifier and models are available for that sequence (see Loading modeled structures). structureViz2 provides two sets of menus, one under the Apps→structureViz top-level menu and the other as part of the context menus under Apps→structureViz. The structureViz2 context menus present a subset of options from the main menu to the user, except that Paint Structure Onto Node, Select Residues, and Find Modeled Structures are only available from the node context menu. The context menus may be accessed by mouse right-click in the Cytoscape network window and vary according to the current selection of nodes and edges. Allow the user to specify which of the structures associated with the currently selected node(s) should be opened in Chimera. This action is enabled when structureViz2 detects a node attribute with one of the recognized names for structure annotations (see Adding structure annotations...). PDB entries are fetched over the web from the RCSB PDB. Small molecule structures are generated from SMILES strings using the smi23d web service provided by the Cheminformatics Group at Indiana University. When a structure has been opened in Chimera, the Molecular Structure Navigator will appear. In addition, structureViz2 will detect all nodes annotated with this structure and associate them with it. Allow the user to specify which of the structures associated with the currently selected edge(s) should be opened in Chimera (works as the Open structures for Node(s) action described above). Allow the user to specify which of the open structures associated with the currently selected node(s) should be removed from both Chimera and the Molecular Structure Navigator. Allow the user to specify which of the open structures associated with the currently selected edge(s) should be removed from both Chimera and the Molecular Structure Navigator. Create a residue interaction network (RIN) from a current selection of residues in UCSF Chimera (see Creating residue interaction networks). This action is enabled when structureViz2 detects an open protein structure and a selection of at least one residue. Allow the user to annotate the nodes in a residue interaction network with the attributes of the residues in the associated protein structure currently open in Chimera. This action is enabled when structureViz2 detects a RIN and an open protein structure associated with it. Transfer the colors of network nodes to the associated residues in Chimera or from the residues to the nodes in Cytoscape. In the second case, the colors are saved in the current visual style. Open the Molecular Structure Navigator. Close all structures and quit from UCSF Chimera. Allow the user to set the attribute names that contain structure annotations as well as the path to the UCSF Chimera application in case it is not installed in the default location. Create an image of the currently open structure(s) and paint it onto the node associated with the structure. The Select residues menu is enabled only when the node has a value for the FunctionalResidues or ResidueList attribute. In that case, the associated residues are selected in both Chimera and the Molecular Structure Navigator. Search ModBase for homology-modeled structures that match the ID for this node. The node ID must be a SwissProt, TrEMBL, GenPept or PIR sequence accession code. If modeled structures are available for the sequence, they are fetched over the web and opened in Chimera (see Loading modeled structures). Figure 2. The Molecular Structure Navigator dialog. In this image, the Molecular Structure Navigator shows three open structures (models): 1EZ2, 1QW7, and 1JGM. The entry for 1JGM has been expanded to show the two chains, and the second chain has been expanded to show the initial residues in the PDB entry. The model level corresponds to a single opened structure. The dialog reports the associated node and the total numbers of chains and residues in the model. The colored outline box reflects the default color of the model in Chimera. The chain level corresponds to groups of residues within a model that share a chain identifier. The residue level reflects individual residues. Residue names and numbers are shown. The levels in the hierarchy can be expanded and contracted. Selecting a model, chain, or residue in the Molecular Structure Navigator selects the corresponding structural element in Chimera. In Figure 2, there are three entries at the model level, reflecting the three open structures. The model entry for 1JGM has been expanded to show the two chains that are part of this model (phosphotriesterase is a dimer), and the second chain (B) has been expanded to show the residues contained within that chain. In addition to selection and navigation within the structural hierarchy, the Molecular Structure Navigator provides menus (top-level and context) for aligning and analyzing structures and adjusting their display. It serves as an alternative interface to UCSF Chimera, but the standard Chimera menus, tools, and commands can also be employed. Invoke the Cytoscape/Chimera Structure Alignment Dialog for aligning (superimposing) structures by model or by chain. In either case, the user must indicate one reference model (or chain) and one or more other models (or chains) to match to the reference. Results from each pairwise match can be used to create new edges in the original Cytoscape network (see Aligning structures). Zoom out to include all structures in the UCSF Chimera display. Identify steric conflicts (close contacts) involving the selected atoms and show them with lines. Identify clashes between the selected atoms and all other atoms. Identify clashes between the selected atoms and other atoms in the same model. Identify steric contacts involving the selected atoms and show them with lines. Identify contacts between the selected atoms and all other atoms. Identify contacts between the selected atoms and other atoms in the same model. Invokes the Residue Interaction Network Generation Dialog for setting the options to create a new RIN (see Creating residue interaction networks). Transfers the ribbon colors of the currently selected residues to the Cytoscape nodes associated with them. Quit from UCSF Chimera and close the Molecular Structure Navigator. Collapse models to hide residues and chains in the Molecular Structure Navigator tree. 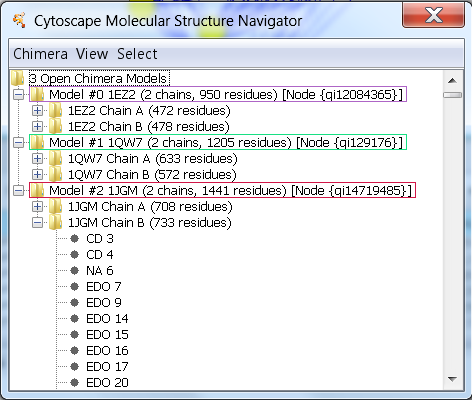 Expand models to show all chains in the Molecular Structure Navigator tree. Expand to show all chains and residues in the Molecular Structure Navigator tree. Refresh the Molecular Structure Navigator tree. Use single-letter abbreviations for amino acid residues. Use three-letter abbreviations for amino acid residues. Use the full names of amino acid residues. 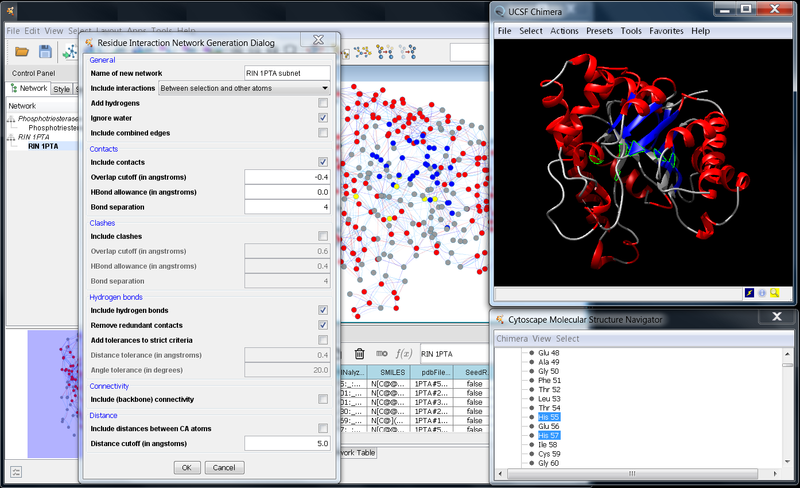 Select parts of structures in UCSF Chimera and the Molecular Structure Navigator. Select all amino acid residues. Select all nucleic acid residues. Select functional residues (available when the appropriate node attribute has been assigned). Invert the current selection (select the unselected atoms and deselect the selected atoms). Clear the selection (deselect all atoms). Two categories of context menus can be accessed by mouse right-click in the Molecular Structure Navigator: those with generic actions, and those which also include special actions depending on the context level (model, residue, or chain). Generic actions are always available, although the scope of the action depends on the context of the pop-up menu. When the mouse cursor is placed on a specific item (model, chain, or residue) when the menu is popped up, the action applies specifically to that item. If the mouse pointer is placed over an empty area, the action applies to any selected models, chains, or residues. Note that when nothing is selected, the context menu can not be popped up in an empty area. Control the display of atoms and bonds in the current context. Show backbone atoms only (these may be obscured by ribbons). Show the sequence of each chain in a separate window (Chimera's Sequence tool). In the residue context, the entire chain sequence will still be shown, but with any residue(s) selected in Chimera and the Molecular Structure Navigator highlighted in bright green. 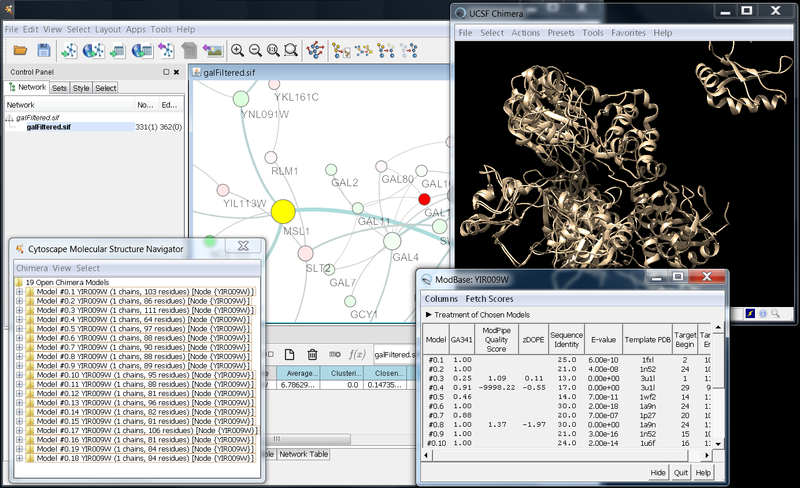 Adjust the view and center of rotation in Chimera to focus on the models, chains, or residues specified by the context. (only available in the model context) Assign each chain in the model a separate color. (only available in the model or chain context) Rainbow-color-code the residues in each chain, starting from blue and ending at red. Color-code atoms by element: grey for carbon, red for oxygen, blue for nitrogen, yellow for sulfur, etc. (see element colors). Use the model default color for carbon, color-code other atoms by element. Control display styles. Different styles can serve to highlight different aspects of a structure, from overall shape to specific atomic interactions. Show bonds as wires and atoms as dots; this style is the simplest and least computationally demanding. Show bonds as sticks and atoms as endcaps (rounded ends). Show bonds as sticks and atoms as balls. Show atoms as spheres using their VDW radii. A ribbon is a cartoon-like representation that traces the backbone of a protein or nucleic acid. It is particularly useful for viewing the secondary structure of a protein. Show edged ribbon (rectangular cross-section). Show rounded ribbon (rounded cross-section). Molecular surfaces highlight the overall shapes of structures and their binding pockets. Show surface as solid. To reveal underlying objects, adjust Transparency (below). Hide atom and residue labels. Label atoms by element symbol. Label atoms by IDATM type. Clear the selection (deselect all atoms). This action applies to all selected items, regardless of the context of the pop-up. Delete all atoms in the current selection. This action applies to all selected items, regardless of the context of the pop-up. Note that deleted atoms cannot be restored except by reopening the original structure, and that deletion will also remove any corresponding ribbon or surface. Select parts of the models in the current context. Figure 3. Importing modeled structures. In this image, the Molecular Structure Navigator shows the result of finding modeled structures for node MSL1, which has the ID YIR009W. UCSF Chimera has queried ModBase and retrieved the results. If the ID of a node is a SwissProt, TrEMBL, GenPept or PIR sequence accession code, ModBase can be searched for homology-modeled structures of the corresponding sequence using Find modeled structures in the node context menu. If ModBase contains modeled structures of that sequence, they are fetched over the web and opened in Chimera. Chimera also displays a dialog, the ModBase Model List, that lists the models and some associated information. There may be a large number of modeled structures, whereas a user may want only one. Clicking a row in the ModBase Model List shows just the corresponding model (hides the others in the list), and the scores and other information in the list can help to identify an appropriate model for further analysis. To close all other models in Chimera, select the desired model in the Molecular Structure Navigator, invert the selection (Select→Invert selection), and then use Close model(s) in the model context menu. Figure 4. Using UCSF Chimera's MatchMaker capabilities to perform an alignment of two structures. In this image two structures: 1PSC and 1DPM had been loaded into Chimera and aligned (Chimera→Align structures→by chain). Structures can be spatially aligned (superimposed) and the corresponding alignment scores assigned to edges in the Cytoscape network. 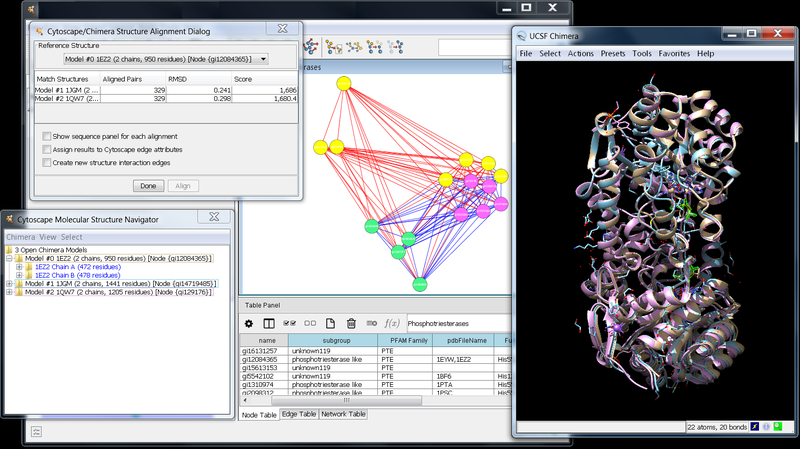 The Cytoscape/Chimera Structure Alignment Dialog can be invoked from the structureViz2 menu or the Molecular Structure Navigator top-level menu. In the latter menu, Align structures includes suboptions by chain for choosing specific chains to use in the alignment, versus by model for choosing whole models. Show sequence panel for each alignment - whether Chimera should display the sequence alignment used to superimpose each pair of structures. In the sequence alignment window (Chimera's Multalign Viewer), the residue pairs used in the final fit are indicated with light orange boxes. Assign results to Cytoscape edge attributes - whether to add an edge between the nodes associated with each reference-match pair of structures, and to assign the alignment scores as attributes of that edge. Alignment Pairs is the number of residue pairs used in the final fit. RMSD is the α-carbon RMSD of that set of residues in the final fit. Score is the score of the sequence alignment (based on both residue types and secondary structure as described above) used to align the structures. Users should be aware that the scores may not correlate well with structural similarity or superposition quality when the sequences are dissimilar and hard to align. Successful superposition only requires the sequence alignments to be partly correct, as incorrect regions tend to be omitted during fit iteration. Omitting parts of the sequence alignment from the fit will affect the number of residue pairs used and the RMSD, even if the resulting superposition is entirely correct. However, in typical usage, the proteins are similar and their sequences easy to align. Figure 5. Creating residue interaction networks from a selection in UCSF Chimera. In this image, the structure 1PTA has been loaded into Chimera and used to create a RIN of all protein residues and user-specified interactions (Apps→structureViz→Create Residue Network). The residues are represented as nodes colored according to their secondary structure and the colors have been synchronized with Chimera (Apps→structureViz→Synchronize Residue Colors). The contacts between residues are shown as blue edges in the network view, while the hydrogen bonds are in red. A subset of nodes has been selected in the structure (as well as in the other views automatically) and a new RIN is about to be generated based on the options set in the Residue Interaction Network Generation Dialog. Residue interaction networks are usually constructed from the three-dimensional structure of a protein such that network nodes and edges represent amino acid residues and their molecular interactions, respectively. RINs have been shown to be useful for relating spatially distant residue nodes and discovering critical residues and their long-range interaction paths in protein structures. structureViz2 can create RINs from a selection of residues in UCSF Chimera. In the resulting RIN, nodes can represent amino acid residues, solvent molecules, ligands, etc., and the edges correspond to (non-) covalent interactions between these entities. As can be seen in Figure 5, five types of edges are supported: contacts, clashes, hydrogen bonds, connectivity (backbone), Cα distances. The parameters for each interaction type are initially set to the default values provided by Chimera as described here for contacts/clashes, here for hydrogen bonds, and here for adding hydrogen atoms. There are different interaction subtypes depending on whether an interaction occurs between the atoms in the main chain (mc), side chain (sc), water, etc., and the number of such interactions is stored in the edge attribute NumberInteractions. For each interaction, the interacting atoms identifiers as well as the distance/overlap are also included as attributes. For contact edges this equals to the (minimum) distance between the closest atoms, for hydrogen bonds to the distance between the H donor and acceptor, for distance edges to the distance between the atoms, and for clashes to the (maximum) overlap between the atoms. After a RIN is generated, all residue attributes available in UCSF Chimera are automatically transferred as node attributes in Cytoscape. Usually, they include secondary structure, hydrophobicity, residue coordinates, backbone and side chain angles, average bfactor, average occupancy and others. In addition, if the RINalyzer app is also installed, the RIN Layout considering the 3D coordinates of the residues as well as the default RINalyzer visual style are applied to the network view, so that the nodes and edges are colored according to secondary structure and interaction subtype, respectively (see Figure 5). Additional features for exploring and analyzing the RINs created with structureViz2 are provided by the RINalyzer app. In order to facilitate the use of structureViz2 and UCSF Chimera from other apps, the structureViz2 app exports a number of commands. These commands may be used by other apps, or as part of scripts that can be executed using the build-in command line functionality of Cytoscape 3.x. Note that the text arguments are placed within quotes. If the argument has a default value, that value is shown below in brackets (). Literal values, such as the booleans true and false or the keyword selected are shown in bold, while descriptions of the argument type such as nodeList or chainSpec are shown in italics, usually with an example following in parentheses. Perform sequence-driven structural superposition on a group of structures. reference=structureSpec|chainSpec: This is the model or chain to be used as the reference for the pairwise alignments. The format is the same as a generalidList except that only a single model or chain may be specified. modelList=generalidList: The list of models to align to the reference model. chainList=generalidList: The list of chains to align to the reference. network=[current]: The network containing nodes associated with the structures to be aligned. It has to be specified if createEdges or assignAttributes are set to true. showSequences=[false]: If true, the sequence alignment for each pair of structures is shown. createEdges=[false]: If true new edges will be created in the Cytoscape network that represent the similarity of each structure with the reference chain. assignAttributes=[true]: If true the RMSD, Alignment Score, and number of aligned pairs are added to the Cytoscape network as attributes. Annotate a residue interaction network (RIN) with the attributes of the corresponding residues in Chimera. residueAttributes=[SecondaryStructure, Coordinates, chi1, chi2, chi3, chi4, kdHydrophobicity, phi, psi, hasNucleicAcidSugar, isHelix, isHet, isIsolated, isMetal, isStrand, type, average.bfactor, average.occupancy]: By default, all residue attributes currently available in Chimera are considered and transferred into the node table of the current network. network=[current]: The network to be annotated. Close some or all of the currently opened structures. modelList=generalidList: The list of structures to be closed. structurePairs=[all|selected]: Pairs of Cytoscape nodes/edges and general identifiers associated with them. By default, all (selected) nodes and edges that are associated with currently open models are set. It is overridden by the modelList argument. Create a residue interaction network (RIN) from the current model(s) in Chimera. networkName=[modelName]: Name of the new RIN. includeInteracions=[Within selection]: The set of residues to be included in the new RIN. In the default case (Within selection), only selected residues are considered. The option Between selection and other atoms should be used to create a RIN for a set of selected residues and their neighbors, while the third option All of the above combines the other two and considers both the selected residues and their neighbors. addHydrogens=[false]: If true add hydrogen atoms to the model before identifying the contacts. For a detailed description of the method and parameters, see the Chimera documentation. ignoreWater=[true]: If true ignore water molecules and do not represent them as nodes in the RIN. includeCombiEdges=[false]: If true create combi edges that account for the presence of an interaction of any type. includeContacts=[true]: If true identify direct interatomic contacts between the set of residues based on VDW radii and user-specified criteria and represent them as contact edges in the RIN. For a detailed description of the method and criteria, see the Chimera documentation. overlapCutoffContact=[-0.4]: Find pairs of atoms with VDW overlap (the sum of their VDW radii minus the distance between them) above this cutoff (in angstroms). hbondAllowanceContact=[0.0]: Subtract this value from the overlap for potentially H-bonding pairs. bondSepContact=: Ignore contacts of residue pairs that are bondSepCont or fewer bonds apart. includeClashes=[false]: If true identify interatomic clashes (unfavorable interactions where atoms are too close together) between the set of residues based on VDW radii and user-specified criteria and represent them as clash edges in the RIN. For a detailed description of the method and parameters, see the Chimera documentation. overlapCutoffClash=[0.6]: Find pairs of atoms with VDW overlap (the sum of their VDW radii minus the distance between them) above this cutoff (in angstroms). hbondAllowanceClash=[0.4]: Subtract this value from the overlap for potentially H-bonding pairs. bondSepClash=: Ignore contacts of residue pairs that are fewer bonds apart. includeHBonds=[true]: If true identify possible hydrogen bonds (H-bonds) using atom types and geometric criteria and represent them as hbond edges in the RIN. For a detailed description of the method and parameters, see the Chimera documentation. removeRedContacts=[true]: If true remove contacts that are actually hydrogen bonds. relaxHBonds=[false]: If true add tolerances to the precise geometric criteria for identifying hydrogen bonds. distSlop=[0.4]: Distance tolerance (in angstrom). angleSlop=: Angle tolerance (in degrees). includeConnectivity=[false]: If true identify covalent bonds between residues and represent them as backbone edges in the RIN. includeDistance=[false]: If true identify distances between CA atoms smaller than the distCutoff and represent them as distance edges in the RIN. distCutoff=: Cutoff for identifying distance edges. Close all open models and exit Chimera. Open a new structure in Chimera. nodeList=nodeList: A list of nodes in Cytoscape to attempt to find attributes with structural identifiers and open all the identifiers for those nodes. edgeList=edgeList: A list of edges in Cytoscape to attempt to find attributes with structural identifiers and open all the identifiers for those edges. network=[current]: The network containing nodes or edges for which structures will be opened. pdbID=pdbID: The ID of the structure in the PDB. This will cause Chimera to fetch	the designated structure from the PDB and associate it with all nodes that have it as an annotation. modbaseID=modbaseID: The ID of a modeled structure in ModBase. Chimera will fetch the modeled structure from ModBase and display it. structureFile=file path: The path to a structure file to open in Chimera. structureViz2 will associate the structure from the file with all nodes that have it as annotation. structurePairs=[all|selected]: Pairs of Cytoscape nodes/edges and general identifiers associated with them. By default, all (selected) nodes and edges that are associated with a structure are set. It is overridden by the nodeList and edgeList arguments. chemStructurePairs=list of pairs: Pairs of Cytoscape nodes/edges and identifiers for chemical structures associated with them. By default, all nodes and edges that are associated with a chemical structure are set. It is overridden by the nodeList and edgeList arguments. showDialog=[false]: If true show the Molecular Structure Navigator dialog after opening the structure in Chimera. Send a command to Chimera. command=chimera command: The command to send to Chimera. No special parsing or handling is done on the string. For a list of Chimera commands and syntax, see the Chimera User's Guide. structureColumns=[Structure, pdb, pdbFileName, PDB ID, structure, biopax.xref.PDB, pdb_ids, ModelName, ModelNumber]: Node or edge columns that are checked by structureViz for PDB and general identifiers (see Adding structure annotations...). chemColumns=[Smiles, smiles, SMILES]: Node or edge columns that are checked by structureViz for chemical structure identifiers. residueColumns=[FunctionalResidues, ResidueList, Residues]: Node or edge columns that are checked by structureViz for functional residue identifiers. chimeraPath=file path: The path to the Chimera executable file, if not using the default Chimera installation directory. Show the Molecular Structure Navigator dialog. Synchronize colors between structure residues and network nodes. cytoscapeToChimera=[true]: If true transfer the colors of the nodes in the current network view to the residues they are associated with in	Chimera. chimeraToCytoscape=[false]: If true color the nodes in the current view with the same colors as the (ribbon) colors of the residues associated with them.